Following Jim Mallinder's dismissal last December, Alan Dickens stepped into a role that he admits was 'thrust upon' him. The defence-coach-turned-attack-coach was parachuted into a position as interim head coach. And with Saints struggling badly, it was something of a poisoned chalice. As expected, there were more tough days after Mallinder's departure. But there were also some bright spots, with one of the real beacons of light coming at Franklin's Gardens in January. Saints welcomed Clermont Auvergne, with the French giants heavy favourites to prevail in the Champions Cup pool stage clash. But Dickens and technical coaching consultant Alan Gaffney, who had arrived in England a couple of weeks earlier, galvanised Saints and got them to record a memorable 34-21 win. 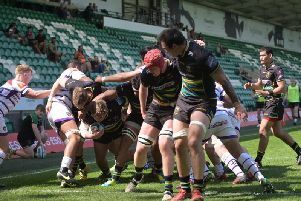 It came seven days after a crucial home victory against Gloucester that ended a run of seven straight defeats in all competitions. And Dickens reflected on those two happy days in the build-up to another Gardens clash with Clermont this afternoon (kick-off 3pm). "You do reflect back to that and it was the weekend after we played Gloucester and on both nights, the Gardens was rocking," said Dickens. "We put in some fantastic performances but last season there was a lack of consistency. "We were able to raise our game at times and there were some positives but it was a tough season." Dickens was handed the role of defence coach when new boss Chris Boyd arrived from the Hurricanes during the summer. And the former Saints scrum-half said: "In terms of the role, it's something I've done previously and it's one I enjoy. "It's got different challenges to the attack or the backs and I'll put all my efforts into being the best defensive coach I can be and hopefully that transfers through to the team on the weekend. "I'm far more experienced than when I did the defensive role a few years ago. "Things have changed, there are more tries being scored across the game in Europe and in the Premiership, so different challenges come with that. "The breakdown is more favoured to the attacking team now. We've got a product to sell in rugby and teams are maybe expanding their game more. "The game is ever-changing and whether or not there is more of an attacking focus now than four or five years ago, I don't know." So, now he has had time to reflect properly, how does Dickens feel about the difficult interim head coach role he occupied last season? "It was one that was thrust upon me because of the circumstances and, as I said at the time, I went wholeheartedly into the role and put all my efforts into it," he said. "Whatever role I have at the club, that's how I approach it. "It was something that was a learning process in that six or seven months and for me going forward and improving as a coach I'll take bits from it and think there are other things I would have done differently. "It was a tough, tough period but we rolled our sleeves up and got on with it." And Dickens insists he still places just as much pressure on himself now. "In terms of the pressure, from my point of view we're all in together, whether you're defence coach, lineout coach, scrum coach, whatever," he said. "Whatever happens at the weekend, it affects me, whether we win or whether we lose. "As a coaching group, we need to put it right and the pressure is only what you put on yourself and we put a lot on ourselves in the coaching group and team." So can Saints produce another big performance to replicate their January success against Clermont this weekend? "In terms of replicating it, it's a different team, a different coaching group, not just on our side but on their side as well," Dickens said. "From our point of view, we want to put in a big performance and the side we have picked will hopefully do that. "Last season, fighting on both fronts was tough and it did take its toll. "We've seen this season that Chris Boyd is keen to push the younger players and we saw Dingers (Fraser Dingwall) go on to the pitch last weekend to make his debut. "The players that take the pitch will be expected to put in a performance and we wish them well." Saints have won the Challenge Cup on the previous two occasions they have played in it. And Dickens said: "Historically, the Challenge Cup is a competition we've taken seriously and the times we've won it we've rotated the squad, which has enabled us to keep players fresh going into the latter stages of the season."